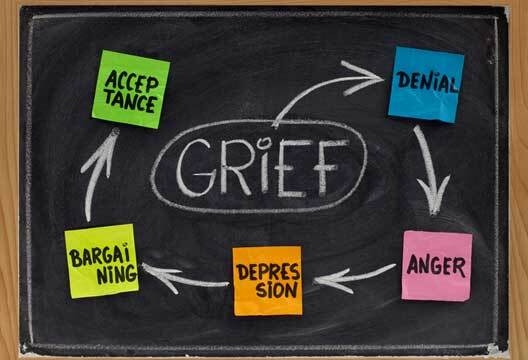 Many people are familiar with the famous ‘stages of grief’ model pioneered by Kubler-Ross. The idea is that we nearly all go through a series of reactions to the pain of loss, whether it is in anticipation of our own death or a reaction to the death of others. These stages have been shown to apply to all sorts of loss: job loss; divorce; emigration. It helps understand the process and the sequence of grieving a loss and adapting to a change. The model makes sense, though there are of course many problems with stage models in psychology. It has been popularised in many graphs and has undoubtedly helped people understand their own and others' reactions. There is also good advice about how to help the grieving. There are various versions of the model/concept and various names given to the stages: denial, anger, bargaining, depression and acceptance. The academics have disputed the number of stages, their labels and most of all whether all or even most of us go through this pattern in reaction to loss. Do some people 'skip a stage', or become 'stuck', unable or unwilling to move on? Does everybody reach 'acceptance'… clearly not. However the theory seemed to come alive after the Brexit vote was announced. Certainly there was the first stage, denial, especially among the metropolitan elite. 'This cannot be true'. 'There seems to be some mistake'. 'We simply cannot have voted to leave!' Hence 'remoaners'. Denial, it is suggested, is soon replaced by fear. Fear of the unknown; fear of being able to cope with less. Fear of pain, fear of being alone. Anxiety is manifest in moodiness and sickness; in gossip and rumour. Repressors try to put the whole thing to the back of their mind; Sensitisers talk to everyone about it. But then there is the anger. Always a difficult emotion for the dying and the grieving; common and expected in divorce; well known in the workplace with redundancies. It’s not difficult to find targets who become, as the psychoanalysts say, 'bad objects'. Who to blame? Anger is easier to express in groups and it mobilises people. Anger is alive and well in the social media. It is this emotion which sometimes is expressed quite suddenly which makes the grieving person difficult to deal with. The theory says the next stage is bargaining but it is not quite certain with whom? If I get through this, I will never be mean to my colleagues or boss again! It may be bargaining with God, or one’s conscience. It may be public or private. And after that, according to the theory, will come depression. This is quite expected by observers but can take those with the loss by surprise. How quick and how long it lasts. A great deal is written on this topic. Probably the most interesting area is that of 'pathological' depression based on time (e.g. delayed depression), chronicity and acuity. The last stage is acceptance: of fate, destiny, the end-game. How many people get there? Does being religious help? Is it a function of personality or defensive mechanisms? Can we all be helped to get to this stage? It is a rich literature though the purists might question the quality of the research. There is also a related issue called survivor guilt. War scars the living and the dead. It is often amazing to see old survivors of battles long ago, chokingly and tearfully recounting their story. Even more poignant is to watch them kneel before graves or stroke a memorial with the names of fallen comrades. Survivors' guilt is a well-established psychiatric condition in warfare. Soldiers know that who lives and dies is pretty random: certainly it is very unpredictable. Paradoxically the survivors are ignored. They are expected to be grateful and ever more hard-working to prove the choice of those who wield the axe. Head down, pitch in and double your efforts. Most people like to believe that they live in a just, orderly and stable world where good wins out in the end. But what if things really are random? Counsellors and therapists talk about the grief process and grief stages. Given that nearly all of us have experienced major loss and observed it in others, might one expect that people would be relatively sophisticated in helping the grieving? This has not been my experience. When my wife was diagnosed with breast cancer, I, like no doubt many others, decided not to talk about it. However, soon thereafter on two occasions I broke down quite unexpectedly at work and had to confess why. Inevitably news got around…..
What became most interesting to me was how those who knew my story reacted. Emails soon spread the news. People I had not seen for years 'dropped me a note'. Few interestingly suggested that we 'meet up'. I think there were essentially six different reactions to the knowledge of my position. Many people do not know what to say to a person in this position, perhaps more so if it is the person who actually has the illness. So, rather than risk a difficult and embarrassing situation, they try to avoid you. You see them in the corridor or street suddenly changing course, ducking into an office or crossing the road once you have been spotted. Some keep their head down; others pretend to be absorbed in a book if they can’t escape. It is difficult to feel anything negative towards them; I have acted like this myself. You feel inadequate, unable to be of help, clumsy. You need time to prepare… a place to talk. But the paradox for the grieving (for that is what it is) is that when you need people most, they avoid you. Yet, it is probably best not to have to deal with a tongue-tied inadequate person, which would only add to your pain. In the second category, people start with a general enquiry like 'How are things going?' or, more specifically, 'How is your wife?' Most mean well, but it is not difficult to detect their uncertainty and discomfort. It is obvious they want to hear 'We are coping well, thank you' or 'As best as we could hope'. They want to express concern, but not lapse into anything deep. They feel it is 'their duty to show concern' particularly if they are not close friends. They do this for many reasons. Like the avoiders they may just feel inadequate to cope with an emotional reaction. It is a bit like not being 'first aid' trained or, in this situation, counselling trained. Some, once reassured, then swiftly move on to talking about other issues, having done their bit. The vast majority of my contacts fell into this category. Perfectly understandable. Nearly every adult knows someone who has, or had, cancer. The data suggest that we will all die with cancer but not necessarily from it. So it is a topic that people have some experience and knowledge of. Yet in some people it releases a passion for alternative and miracle cures. I received emails about how changing your diet, mindset or behaviour pattern would bring about spontaneous remission. I was given strange teas and pills by people who, no doubt, meant well. They did not want to talk, but rather offer advice on a miracle cure. My research into alternative medicine and the personal experience of a school friend dying of cancer many years ago came to mind. People are often 'pushed into', rather than 'pulled by' alternative therapies when conventional medicine seems to offer little hope or explanation. My friend was given six months to live and aged 47 and with a 10-year-old child the fear and pain must have been intense. He spent a massive amount of money travelling to America for some miracle shark’s blood cure that, of course, did not work. Most people feel they are good listeners. The data would suggest otherwise. Anyone who has been on a counselling course knows some of the rudimentary skills to active listening. I came across a few good listeners: some had been trained, but for others it was instinctive. They picked their time and place. They did not use euphemisms and they talked as much about my wife’s emotions as mine. This nearly always ended in me being very tearful, a situation I am very uncomfortable with. I was baptised in the cold water of Protestant stoicism, educated not to show my feelings, particularly if it embarrassed yourself or others. And yet, of course, the experience is intensely therapeutic. ‘Nothing like a good cry’, as my grandmother would say. I feel deeply indebted to a few who gave me time to explore my confused and painful emotions. This group is perhaps the most helpful. It is not that they do not believe in the talking cure, but rather that they supplement it. They offer practical help rather than advice, knowing how little things become more difficult. A friend arrived more than once with a full hot meal that meant we had leftovers for further lunches. A neighbour gave lifts to appointments. Still another offered to do the garden. One, knowing the cost of treatment, offed a substantial loan. This is what my mother would have done, and it is very welcome. It is not a substitute for the “talking therapy” but a supplement to it. This group is toxic and unwelcome at the best of times, being composed of individuals with sub-clinical personality disorder-like behaviours. You would not have them as your friends, but you may be forced to deal with them even in tough times because they are part of your family or are neighbours. These people are characterised by their pathological lack of empathy and sympathy: expect no commiseration or comfort from them. Rather, they see no reason to discontinue their personal vendettas, whatever the change in your circumstances. This group can demand a disproportionate investment of emotional energy when your system is already stressed and struggling to cope. Fortunately, these people are the exception and their behaviour recognised as ‘socially unacceptable’ by the kind and caring types in all the other groups. Of course, this is all about my reaction: what about my wife, also a psychologist? It was she who reminded me about the last type of reaction, which I had clearly repressed. Out of interest we predicted the reaction of various friends and acquaintances to verify the category scheme. We believe we are on to something. And, yes, thank you. We are in remission and the prognosis is good. - Professor Adrian Furnham, University College London.